Delicious Senior cat food slices for a convenient and fresh meal, wet cat food pouches for cats aged 11 years onwards made with carefully prepared recipes. 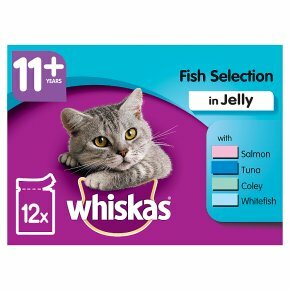 Easy to eat and optimal to digest for your ageing cat. With balanced mineral levels to support urinary tract health. Nutritionally complete & balanced to help her stay happy and healthy. Delicious cat food slices for a convenient and fresh meal. Our WHISKAS® 11+ range offers a variety of tailored meals, with taurine to help your cat maintain a healthy heart. Our tasty meals, made with a combination of selected natural* ingredients +vitamins +minerals, provide everything your cat needs for a healthy life and strong natural defences. 24h Daily Feeding Recommendation Pouch Only: 3 kg x2, 4 kg x2 1/2, 5 kg x3 Pouch + Dry Food: 3 kg x1 1/2 + 15 g, 4 kg x2 + 15 g, 5 kg x2 + 25 g We recommend to feed a mix of WHISKAS® wet and dry food. 77 kcal / 100 g Feeding Instructions: Allow a transition phase, adjust amounts and divide it into meals according to your pet's needs. Visit our website or call our Consumer Careline for feeding information. Fresh water should always be available. Serve food at room temperature, surplus food can be chilled for up to 2 days.